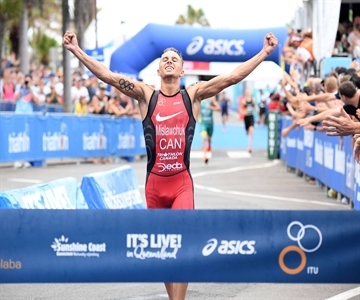 The coastline of Queensland, set in Australia, was the stage for the 2019 elite men’s Mooloolaba ITU Triathlon World Cup. A stacked field of 67-men lined up to take on the sprint distance race format, featuring a 750m ocean swim, 20km technical bike course and 5km hilly run. Conditions cooled down considerably as the elite men took to the stage and hit the water for the first portion of their race. Tyler Mislawchuk from Canada, a firm race favourite leading into today’s race, produced a slick first transition to lead out onto the bike course. A train of men tracked closely behind. Nothing could separate the group of at least 30-men as they pushed together across the 4-laps of the bike course. Each taking turns out in the front seat but no one was brave enough to breakaway. The bike course, which coasted along the ocean, was tight in sections and an unfortunate tumble on the iconic Mooloolaba roundabout saw America’s Eli Hemming withdraw from the race. It was a fierce rush as the elite men approached the second transition for the day. New Zealand’s Sam Ward, Mislawchuk and Australian Olympian Ryan Bailie were the first out onto the run course. Within the early stages of the running race Mislawchuk made a bold move and glided out in front. The Canadian looked calm across all three-disciplines today and was strong enough to dominate as the front runner. On the bell lap of the run, Germany’s Valentin Wernz and Australia’s rising star Brandon Copeland were chasing Mislawchuk to battle it out for the other spots on the men’s podium. Mislawchuk was a powerhouse across all three disciplines today and his striking bike and run combination allowed him to take the tape and be awarded with the gold medal. “First World Cup win, I am over the moon and I am just so excited. “Australia is my second home, I’ve got a lot of friends out so it’s awesome to be able to do it in front of them,” said Mislawchuk. Australia’s young gun Copeland was thrilled as he crossed the finish line to be presented with the silver medal for Australia and Wernz rounded out the men’s podium with a bronze medal for Germany. “I am absolutely stoked with that. I came here hoping for a podium and it all came together today,” Copeland said. To come out here and get a result like that, hopefully that will put my name in the ring,” added the aspiring Australian Olympian. “My first time in Australia and first podium on the World Cup circuit, I am so happy. I had a good transition and tried to hold onto Tyler (Mislawchuk),” Wernz said.